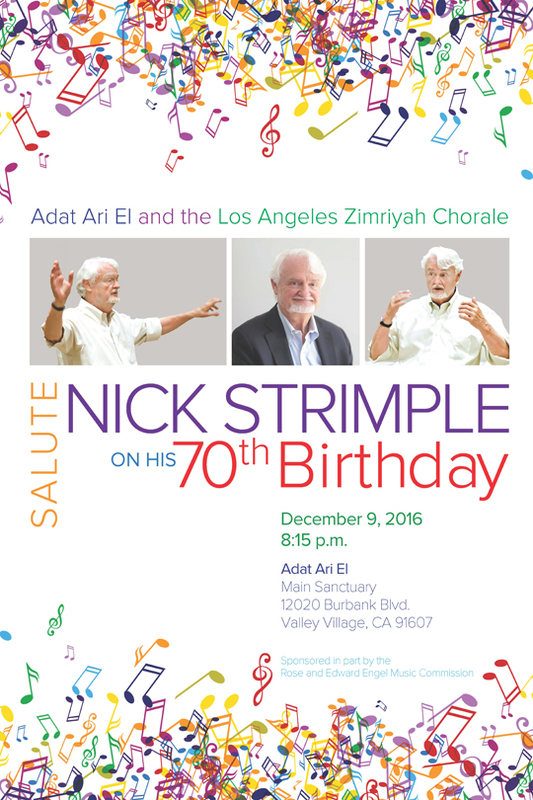 You're invited to honor Nick Strimple’s life-long efforts to unite people through music. On December 9, 2016 Adat Ari El, the Los Angeles Zimriyah Chorale (LAZC), and guest artists are set to celebrate with a survey of his Jewish-related works. On hand to honor Strimple during the evening concert, distinguished vocalists and instrumentalists are scheduled to appear. Strimple will conduct the LAZC and a supporting girls choir, the Beverly Hills High School Minnesingers. The program consists solely of original compositions written by Strimple and features the world premiere of Shahar Avakeshkha, and the U.S. premiere of Zacharti Lach. Working to bring people together through music, American composer and conductor Nick Strimple enjoys a diverse career as professor, author, and scholar. Having written over 130 works in virtually all genres, including television and film, Strimple’s works often explore and unite contrasting themes. In demand as a composer, his compositional range and contemporary perspectives have drawn commissions from many organizations including the Vienna International Organ Festival, the J. Paul Getty Museum, Diva Complex, Jorge Mester, and the London Youth Choir. Featured in live concerts throughout the U.S., Europe, and Israel, his music can also be heard on the Naxos, Music & Arts, and 4-Tay labels. Employing music to cultivate dialogue and understanding, Strimple’s conducting appointments often unite interfaith choirs, citizens, religious groups, and diplomats. His efforts to reconcile different cultures and faiths provide conducting opportunities with some of the world's finest ensembles. His latest conducting appearances include the London Symphony Orchestra, the Orchestra and Chorus of the Polish National Opera, the Slovak Radio Orchestra, London Voices, the YMF Debut Orchestra, the Prague Radio Choir, the Ernst-Senff Choir (Berlin), the Berliner Domkor, and the Hollywood Bowl Easter Sunrise Services. With the Nuremberg Symphony, Strimple served multiple years as special projects consultant and guest conductor, and fulfilled a similar role with the Prague Symphony Orchestra. In ongoing efforts to build bridges between faith communities, cultural groups, and educational populations, Strimple works with student, local, and congregational choirs and has toured twice with the Cantors Assembly. An authority on Holocaust-related music, Strimple explores the personal and cultural impacts of music related to war and genocide. To inspire reconciliation he writes and speaks about music as resistance and the influence of music produced in concentration camps and ghettos. 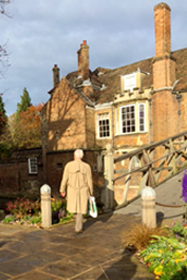 Strimple’s work as lecturer and clinician relies on these topics to instill understanding at leading educational institutions including most recently Cambridge University, Yale University, Oxford University, and Wellesley College. 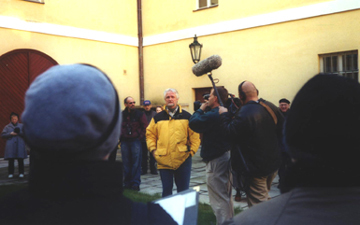 Often sought for his expertise, Strimple has also served as a consultant with Holocaust-related organizations including the Los Angeles Museum of the Holocaust and Warsaw's Museum of the History of Polish Jews. 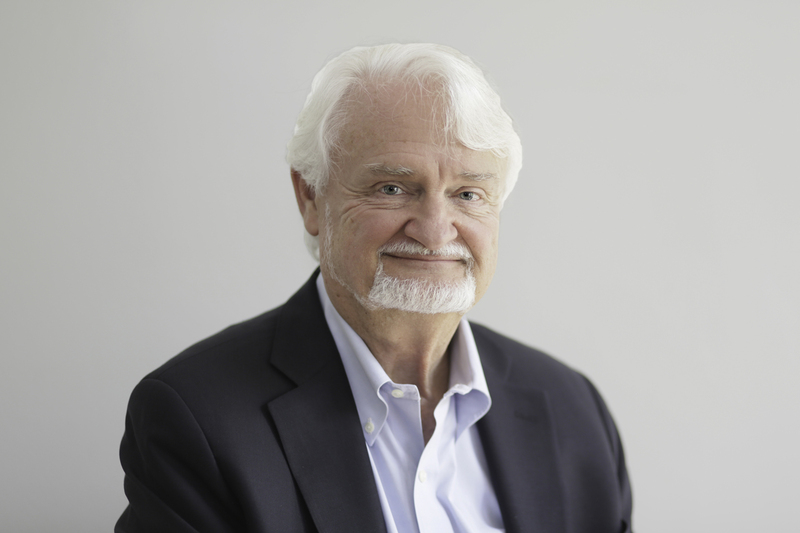 As a member of the California State Legislature Working Group for Holocaust, Genocide, and Human Rights Education, he helped write legislation mandating genocide education in California. Additionally, Strimple publishes Holocaust music opinion and commentary in journal articles and book chapters. In 1996 Strimple joined the faculty of The Thornton School of Music at the University of Southern California. Since 1998 he has served as Music Director of the Los Angeles Zimriyah Chorale. His critically acclaimed Choral Music in the Nineteenth Century and Choral Music in the Twentieth Century are used as textbooks worldwide. (l-r) Rand Harris, Alberto Mizrahi, Nick Strimple, Joe Gole, Ofer Barnoy, David Lefkowitz and Raphael Frieder at the 56th Annual Cantors Assembly, 2003. Cantor Nathan Lam, Marek Zebrowski, Waldemar Dabrowski, Katarzyna Nowicka, Nick Strimple and Barbara Kopinska after a concert in the Polish National Opera, 30 June 2009.